It was my aim to write about this game on its own terms, without continual comparison with the men’s game, and I will do so – in a paragraph or two. It would be remiss, in the period between the two UEFA Champions League finals, of me not to mention the huge disparity that characterizes football’s gender divide. On Saturday evening, Wembley (capacity 90,000) will be full to the brim of punters who have each paid at least £175 for the privilege. 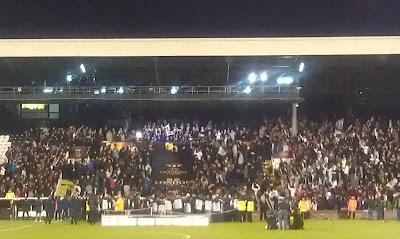 On Thursday night, Craven Cottage (capacity 25,700) was around half-full; this in spite of tickets being priced at a very friendly £5 a pop. UEFA is a consummate marketing machine and they know the value of their product. The huge gap in the affordability of access to these two flagship events is a sorry indictment of UEFA’s estimation of the quality of one half of that product. Think of it like this, Platini and his cronies are sufficiently brazen to charge a frankly ludicrous £26 ‘administration fee’ on top of the already painful price of a ticket to the men’s final because they know that people will pay it. That the same amount would get you five (5! FIVE!) actual, tangible tickets (as opposed to the abstract, ethereal and most probably non-existent phenomena of ‘admin’) shows how little faith they have in the women’s game. It’s a disrespectfully token amount: ‘Obviously we’re going to lose on this one, but we’ve got to charge something’. This price is so low, remember the game’s in London where theatre tickets start at 10 times that amount, that it probably discouraged as many potentially interested punters as it attracted. All of this is a massive shame. 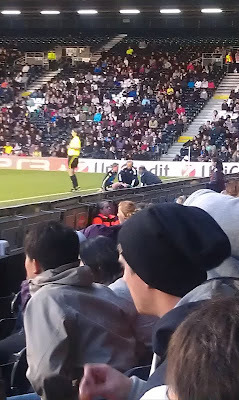 Craven Cottage is a fun place to watch football and this was a brilliantly entertaining game. My evening started with Tube delays. It took me the best part of two hours to get from Swiss Cottage to Ealing Broadway. I know! Unbelievable right? So annoying, I don’t know how/why we put up with it. Blah blah blah etc. etc. Apart from spawning comic gold (see above), the rain delay seriously curtailed my pre-match drinking. Which was limited to a (very) swift pint of something called ‘Junction’ in a non-descript, but not cheap, pub on the Fulham Palace Road. The sun had come up by this point, so we were able to enjoy our drinks outside; which is always nice isn’t it? Outside the ground the atmosphere was wonderfully genial. A personal highlight was when I endeared myself to two old boys in luminous jackets, volunteers presumably (must keep costs down! 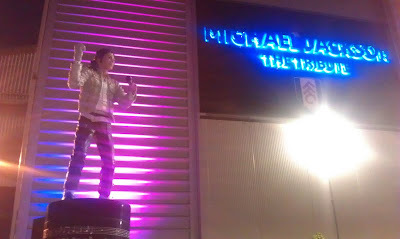 ), by asking cheekily where ‘the statue’ was, being stonily informed that it was ‘that way’ before lightening the mood by clarifying that ‘I meant Johnny, not Michael – come on lads!’ Oh how we laughed. 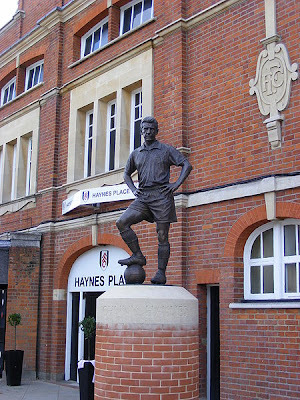 Of course, we really were only interested in seeing the abominable shrine to one of humanity’s most shameful creations (Michael, not Johnny) but I now had a ‘rep’ to protect, so we wandered off in the direction of Johnny Haynes and our seats (don’t worry, we snuck back later). We were heartwarmingly, but equally unbearably, situated right in front of a group of around ten 10-14 year-old girls (I’m not very good at guessing young girl’s ages – a trait perhaps attributed once or twice to a certain famous pop-star). 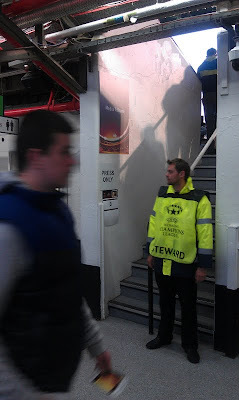 These seemed to be a football team, and their near incessant high-pitched shrieking (‘ooh… it’s a corner. ooh… it’s a corner’; ‘the referee’s a tomato’ – she actually sort of was, more later) was punctuated by some occasionally telling commentary (‘she has a good first touch, Miss’). These were exactly the type of people the game should (but didn’t really) attract – although the 8 o’clock kick-off time probably did some damage here – and they seemed to really, really enjoy themselves. Which is great (though annoying). Although, as I’ve already said, the game was very exciting, the first-half took a bit of time to get going. Lyon’s quick and skillful winger Elodie Thomis carried most of the early running, and although she tired in the second half her link-up play with the magnificent Swedish centre forward Lotta Schelin was one of the principal reasons for Lyon’s sharper attacking edge throughout. 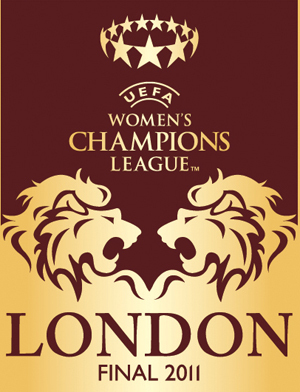 It was through their combination play that Lyon won the corner from which they opened the scoring, Wendie Renard bundling home after Sarholz in the Potsdam goal had kept out the original effort. The girls behind us were particularly delighted by the identity of the goalscorer. Renard, with her superb bonce, stands out and seemed to be their favourite player. My favourite player (though Lyon’s Camille Abily won the Player of the Match award) was Amandine Henry, who anchored Lyon’s midfield three with a mixture of astute positioning, combative tackling and neat passing. 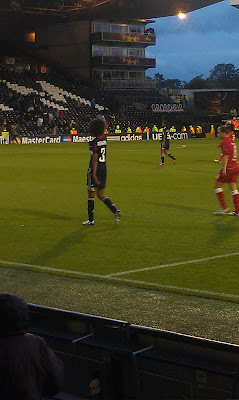 She and Schelin looked the most technically accomplished players, and Lyon’s victory was based on their shared ability to dictate the pace of the game. That’s not to say, however, that Potsdam were completely overran. Lyon’s first goal came in the 29th minute and the second didn’t arrive until the last five minutes. In the interim period their star Fatmire Bajramaj (top scorer Yuki Nagasoto missed out through injury) showed incredibly quick feet and lovely touch in creating a number of chances; two particularly presentable examples squandered by players I unfortunately couldn’t identify (one of them could have been Mittag, who had a really poor game). The hour between the two goals was fairly heroic. To say that referee Dagmar Damkova (yes, she’s a she too) let the game flow would be an enormous understatement as even blows to the head were deemed insufficient justification for a blown whistle. Essentially, she blew for disruptive fouls of a cynical nature and very little else. This was not because of unusually dainty tackling; far from it, tackles were flying in all over the shop and players showed an incredible readiness to go to ground in pursuit of possession, but not in pursuit of free-kicks (they wouldn’t have got them anyway). For a while, it looked as though the physically superior German side were going to use the veggie-fruitlike referee’s leniency to their advantage with Thomis, in particular, on the end of some seriously hefty challenges. Things never got out of hand however and it was to the players’ credit that every challenge was rebounded from and responded to with a grin and a handshake. That said, it would have been nice to see the Lyon phsyio (possibly Europe’s fastest almost-bald man) sprint into action on more than the one occasion on which he was required. On the other hand, the referee did fall over and you can’t have it all. 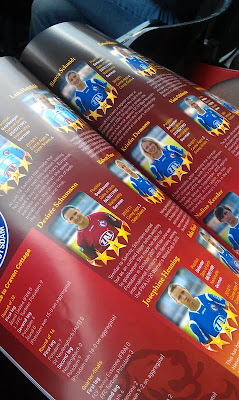 Incredibly, even after substitute Lara Dickenmann rounded off a neat move by absolutely shellacking the ball beyond Sarholz, Potsdam manager Bernd Schröder didn’t make a single substitution. I really don’t know what to say about that, any ideas? At full-time the Lyon bench sprinted out to celebrate and the entire squad ran over to dance in front of the area of the stand dedicated to their small but passionate support. They then climbed the stairs into the stands together, which is the best way to receive a trophy. This was handed to them by UEFA president Michel Platini, who I hope enjoyed the game and deemed a fiver exceptionally good value for such entertaining fare*. * I mean ‘fare’ here in a firmly metaphorical sense. 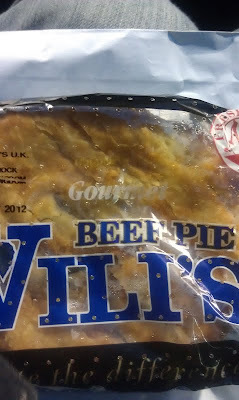 The actual fare on offer, sampled by me in the form of a ‘gourmet beef pie’, was absolutely repugnant. For some reason it was wrapped in some form of cellophane – how was it cooked, how on Earth was it cooked? – and was so greasy that I had to skip the post-match pint in order to run home to my toothbrush: so much grease, why oh why won’t it come off….